The Pro 600 gets our vote simply on basis that aside from colour and a travel case the Pro 650 does not offer anything more. A travel case and colour is not a necessity of the brush. Either are good no nonsense brushes that focus on getting the job done. The Pro 650 comes with a Black rubber on the front compared to the Blue or Pink of the Pro 600. The Pro 600 comes with either a CrossAction or FlossAction brush head whereas the 650 comes only with a CrossAction. The Pro 650 comes with a travel case included in the box. Detailed Comparison: What’s the difference between the Oral-B Pro 600 and Pro 650? In writing this comparison I almost feel that I am cheating you into believing there is more between these two brushes than there really is, but the fact of the matter is that the 4 bullet points above summarise the key differences between these two brushes. There is a bit more context that can be added around these differences to better understand why the two models exist and how one might be better suited to you, so please find the more detailed explanation of this below. Starting with the naming of the brushes, the Pro 650, is often known as or referred to as the Pro 650 Black. This is because it comes in one colour option and the Black colours tend to be a bit rarer to find. The Black refers to nothing other than the rubber grip colour there are no other special features, it just seems to be a marketing thing that Oal-B do. Whilst typically the Pro 600 is available in the baby blue colour, you can pick it up in pink too. These colour options are not available on the Pro 650. As far as cleaning modes go, both brushes offer exactly the same cleaning mode, that is the ‘Daily Clean’ mode which is found on every Oral-B brush. The more premium brushes offer additional cleaning modes which are suitable if you have more advanced oral healthcare needs or are looking for a particular programme such as whitening. If however you are looking for a simple, get the job done electric toothbrush either of these models will suit you nicely. When it comes to good oral health, the most important thing over and above anything else is to brush your teeth at least twice a day for 2 minutes at each time. With this you want to ensure you have the correct technique. However, what is great about an electric toothbrush over a manual brush is the increased consistency in cleaning motion that it can offer and this is why you will often see toothbrush manufacturers claiming up to 100% more plaque removal. Plaque is a harmful substance that builds up on teeth and around the gumline and you want to remove this as effectively as possible. With either of the Pro brushes shown here, the daily clean cycle lasts for 2 minutes (120 seconds) and sees 8,800 oscillations and 40,000 pulsations through that cycle, a number of movements not humanly possible. It is this paired with the consistent power from the motor and the scientifically engineered brush heads that ensure a clean that surpasses that of a manual brush. When it comes to brush heads, the Pro 650 will come supplied with what is the more common CrossAction brush head, whereas the Pro 600 will come with that or the FlossAction head. Both will clean the teeth well, but the FlossAction will get deeper in between teeth and can be better for those who struggle to floss effectively. Either brush will only come with one of the heads in the box. Whether it is a head that you find suitable or not will be a personal decision. The good news however is that these brushes accept a range of different brush heads that are engineered to achieve different things or may suit your preferences better. Whilst technically any of the Oral-B brush heads can be fitted and used on any of the cleaning modes, some are better suited to particular cleaning modes. We discuss this and include diagrams in our Oral-B brush head comparison post. With either the Pro 600 or 650 during a cleaning cycle at 30 second intervals, you will get an audible and visible notification to change quadrant via a slight pause in the brush head movement. When this happens it is time to change quadrants. With 4 quadrants in the mouth, (bottom right and left, along with upper right and left) you should spend 30 seconds on each during the 2 minute cycle. Box contents in either of these brushes is fairly limited in comparison to more premium brushes like the Pro 6000, but included is what you need. Where the Pro 650 may appeal to some a little more is the inclusion of the travel case. If you are always on the move with overnight stays or traveling from place to place the hard plastic case provides a home for the brush and the brush heads (up to 2) and stops either coming to harm. Whether you want or need this is personal. Some will just throw the brush into a wash bag or you can always pick up a travel case at a later date, although it will be more expensive. It is important to try and protect the brush head a little from damage as these are what do the cleaning and damaged bristles can actually cause more damage than you think. Remember to change your brush head every 3 months and do not share with others. You can share the brush handle, but swap the heads. Original Oral-B heads have bristles that fade in colour as time passes giving you a guide when it is time to swap. Where these two brushes also vary is cost. If you share the brush handle with others such as family members it can bring the cost of ownership down. At the time of writing and based on one user, the cost of the Pro 600 is 5p per day over 3 years compared to the 6p of the Pro 650. Prices are always changing so this is only a guide. Generally speaking you can pick the Pro 650 up for £35 and the Pro 600 from £25-35. There are of course many similarities between these two brushes and both have some design and features I have not touched upon yet, but I believe are worth noting. A feature that is not really marketed, but exists, is something called sound connectivity. You may see this more with the Pro 650 marketing than any other. No. Both have the same cleaning mode and technology and do a great job of cleaning. Different brush heads may have some small benefits and improvements for different users, but there is no difference between the actual brush handles and the clean they deliver. Generally speaking, the Pro 600 is the cheaper of the two, but it depends on what deals are running at the time. When you come to buy, check the price of the Pro 650 as well – if one is much cheaper than the other then go for that one. With so few differences between the brushes, the conclusion I come to will be different to yours, but at the end of the day both do a great job of cleaning teeth. The Pro 600 gets our vote for price and simplicity. For frequent travellers or those who like the colour black, the Pro 650 is going to be your choice. 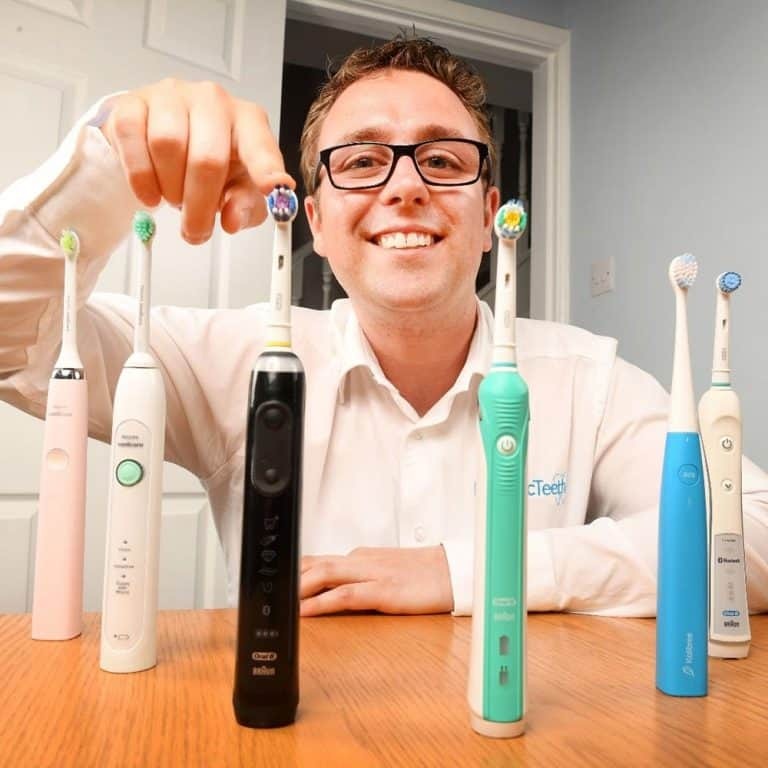 All want is a simple electric toothbrush up to the job. Is there any major difference in the power of the various brushes and is a more powerful brush required. The inference is that the higher the number the more powerful and therefore better cleaning action. Sorry for the slight delay in reply. Whilst some models do have more powerful motors and in turn the potential to clean better, there extra power does not make much difference in the scheme of things, technique and regularity have a bigger impact. However, if you were to look at the Oral-B Pro 2 2000 or Pro 2 2500, these gain extra power over the 600 but are still very reasonably priced. The most powerful brushes are much more expensive. My pick is the Pro 2 2500. What is the difference between this and the 790 or the 2000? The 790 from Oral-B is a dual handle pack. Essentially the 790 is 2 of the Pro 650 brush handles in the box with 1 travel case. These differences are the same for the 790 except with the 790 you have 2 brush handles.